Description: A.V.Vampilov was born on August, 19th 1937ú. In ancient Siberian village Kutulik (in maternity hospital Cheremkhovo) Irkutsk area. In 1958 in the newspaper of Irkutsk state university of faculty филологиии where it studied, under A.Sanin's pseudonym the story "Coincidence of circumstances" for the first time has been published. In 1963 - 65 Vampilov studies in Moscow on the Maximum literary rates at Literary institute in them. M.Gorkogo, where approaches with many Moscow writers and directors (A.Tvardovskim and V.Rozovym, etc., O.Efremovym and G.Tovstonogovym, etc.). After returning to Irkutsk in almanacs "Angara" and "Siberia" were issued all its dramaturgic products (" Farewell in June ", 1964; " the Senior son ", 1965; " Duck hunting ", 1968; " the Last summer in Chulimsk ", 1971; One-act plays " Twenty minutes with an angel ", 1962, and " History with метранпажем ", 1971, later incorporated under the general name " Provincial jokes "). In 1972 A.Vampilov tragically was lost on August, 17th, having sunk in Baikal. 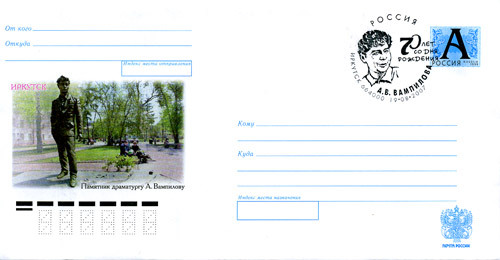 20.09.2003 in the center of Irkutsk is opened a monument to playwright A.V.Vampilovu.